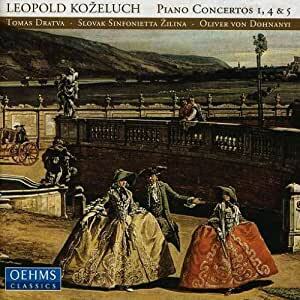 This recording of 3 Kozeluch piano concertos is very pleasing to listen to. The music is from around the same time as Mozart, however stylewise, it reminds me of the Joseph Haydn piano concertos. It was written simply to entertain the masses of the time. I love this style of music and the pianist plays wonderfully! If you like to listen to more obscure composers of this era, you should listen to this one. I find the orchestra to be acceptable but not up to the playing standards of the Prague Chamber Orchestra however, this recording is worth the investment!